Butterfingers is a microgame in the Strange folder in WarioWare, Inc.: Mega Microgame$!. It reappears as part of Mona's set in WarioWare Gold. At the bottom of the screen, there is a toaster. Above the toaster is a hand. 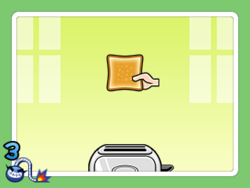 After a certain amount of time, a piece of toast will fly out of the toaster, and the player must press the to make the hand catch the toast. 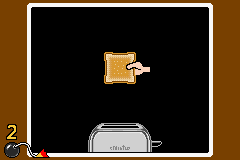 1st level difficulty: The toast is intact. 2nd level difficulty: There is a small bite on the toast. 3rd level difficulty: There is a large bite on the toast. Spanish (NOA) Tosta-loca Pun of tostadora (toaster) and loca (crazy). This page was last edited on April 10, 2019, at 21:51.